Here at Wessex Tubas, we’re incredibly proud of everything we put our name to - and have the utmost confidence that every single instrument our customers receive from us is of exceptional quality and plays well. This is not only due to our scrutinous approach to quality assurance - personally checking every instrument and signing each one off before delivery - but also to our ongoing relationship with the factory manufacturing our instruments; the time and energy we, and the factory team, invest in getting the process just right. That’s why, we thought to ask our founder, Jonathan Hodgetts, to tell us all about his most recent visit to the factory, and what a typical week there is like for him. “18th March saw me embark on another visit to the factory in China where our wonderful Wessex instruments are created,” Jonathan explains. “Ready for a week of quality assurance, play testing, planning and development. “After a 10 hour flight, I was met at Beijing airport by a car that whisked me off to our hotel, via another terminal where we picked up my beautiful wife, as she was already in China visiting family. Having arrived early on Sunday, my wife and I spent the remainder of the day resting, ready for a full week at the factory from Monday. “An 8am start on Monday morning - upon my arrival to the factory, I was greeted by the new management team responsible for manufacturing Wessex products. “As the factory have undergone a recent restructure, and moved to a much larger premises - each floor the size of 2 football pitches! - I was keen to meet the new people responsible for such an integral part of the process. 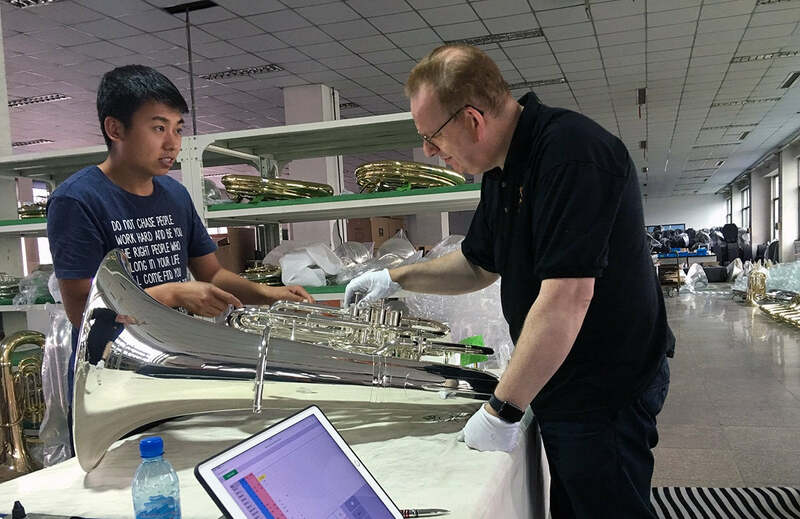 “A bigger management team than we previously had looking after our products, Wessex now also has its own dedicated team of the best craftsmen at the factory building our instruments, and a new expert - overseeing instrument developments; a skilled and highly talented professional with 40 years experience, Mr Zhang, who is renowned as the best brass builder in China, and an individual I am very proud to be working with. “After a productive and positive meeting, the hard work truly began as I settled down to start the quality assurance process, and check our biggest order to date - over 200 Tubas, to be exact! “Whilst this may not seem like a lot to get through in 6 days, it’s important to us, and to our customers - like your good self reading this - to ensure every element of each of our instruments is checked thoroughly; both cosmetically and technically, before each is play tested. “Play testing is no doubt the part of quality assurance I most enjoy, helped by a fun tuning app on my iPad which helps me assess whether each instrument is perfectly in tune when I play it. It brings no end of delight to the factory team who, as a big - and slightly silly! - green smiley face appears on the screen when an instrument is completely in tune, waste no time in cheering on their triumph! “Any instrument where defect of any kind is found, is sent to be checked over by what my wife amusingly calls the “tuba doctor” - the factory’s technical expert. If it can be fixed, it will be returned for re-inspection - if not goes to be dismantled and rebuilt. “Following a busy morning of inspection came a well-earned lunch break, where my wife and I were treated to some wonderful, traditional Northern Chinese cuisine by our Account Representative at the factory who over the last seven years has become a good friend. “Always a fabulous banquet, particularly welcome after a long morning of careful inspection, I must say that we are always very well looked after at the factory, and by the staff there; working together to ensure everything created under the Wessex brand is of a quality and standard we’re all happy with. “Although I visit the factory once every 3 months for 6 days, specifically to check and test every instrument, I talk to the team at the factory daily to ensure everything’s going well, specifications are fully understood, production is up-to-date and to clarify the finer points of new model development. “This means that, when I do visit, we’re able to fit so much more into my visit - the quality assurance of 200 Tubas, and the planning and initial prototype build of new, upcoming instruments, too (something I’ll go through in part 2 of this blog series). A jam-packed itinerary for a dedicated team of skilled professionals, and a team I very much enjoy working with and have close relationship. To browse our range of products, visit our online shop.